The journey of a Developer that has the pleasure and gratitude of having WordPress as a resource. Who am I and am I good? We define ourselves in order to navigate life. Like we brand our business, our clients’ website, we brand ourself as well. Remember to define yourself, because others are always going to be doing it for you. Be true to yourself. We are all the same, yet different. We all hurt and desire, yet what we are motivated by may be different. Be true to yourself to follow what you know is meant for you. Trust in the journey. For it is the journey, not the destination that not only makes up one’s day, but ultimately defines us once we have arrived! In sixth grade the upcoming graduation book requested what would you like to do… while most the girls wrote modeling, acting (we are in Southern California after all) I wrote discover a new animal. Discovery has always been one of my passions. WordPress has been a way to discover new ways to combine code to ‘make things happen’ by creating plugins. WordPress has provided a place to practice the developers’ craft. I’m a working dev and I have a lot of thanks to give the WordPress community for that. I have been given time, support, and much patience. The meetups have provided a place to gain the ground work of what concerns that would need attention and what would be good practices to put in place to ensure site performance. Have courage of trying and failing and trying again. Practice the art of asking lots of questions. Remember, “sometimes it is the people who no one imagines anything of, that do the things that no one could imagine.” So even if someone questions your work, whether you could ever possibly have done that or do that, keep going. Imagine an engineer writing a program, a developer creating an application, and a social media specialist crafting creative content. Do you see them at their desks? What does the engineer look like? What does the developer look like? Did you picture anyone of them as a female? Typically not, perhaps the one crafting creative content was pictured as female. Rarely is a developer or engineer pictured as being female or looking anything like me. We need to change that. It’s been proven that when given identical resumes with name either David or Maria, the hiring committee will determine David to be identified as more qualified every time. Maria’s accomplishments had to be 2 times more in stature before being seen as equally as qualified as David. We hold ‘implicit biases’ both men and women, it is a cultural thing that men are seen as more qualified as a developer. Acknowledging this is the first step. What can we do to help turn this around? First let’s visit why we should turn this around. We are facing very real large complex problems as a community that requires developers to figure out. Specifically, in the WordPress world, we need a platform, themes and plugins that appeal to a large audience. True innovation requires a diverse team. It will ensure that different viewpoints, ideas, and solutions are discovered. Women are an asset to the team, especially in the role of developer. Consider the fact that many women are making the buying decisions whether directly making the purchase or helping with the decision. A woman on the team as a developer helps to create a product that appeals to a larger audience and ultimately higher sales. Female developers will bring insight to the possibilities of products that are currently missing and overlooked. How to change this? Hire more women as developers. Make it point to include describing/depicting developers as women in marketing materials and encourage women to apply for developer positions. If you’re female reading this, you like to problem solve and build things, give development a try. Just because things are the way they are doesn’t mean they have to stay that way. Typically, women aren’t developers but that can change. WordPress is a community in which women developers can thrive. WordPress is stronger as a community because of its diversity of users and creators of WordPress. We all benefit from diversity. By having diversity within our community we grow, we build. Ultimately, we create more opportunity for all. Woman as developers are viewed as being different. Many are questioned why they are doing this. Women will even be looked at like she shouldn’t be there. Women are conditioned from a young age to be princesses, not engineers. Developers are competitive, like great writers. Competitiveness for the best projects is part of the game. This game is not something that females get ‘taught’ or necessarily have experience at. Men joke with each other differently than women do. Entering the environment from a female perspective, it may seem aggressive and uninviting. It helps to have experience in team sports to help to manage and navigate the competitive male dominated culture of the field. Another way to ensure success is to join a group that supports women in tech. It will help to deal with issues that arise and gain confidence to deal with a group that is dominantly male oriented. Typically, women and men communicate differently. Also, I find it a way to relax and relate without needing to worry about so many other unrelated issues. It provides a platform to discuss issues like family, which many times a big impact on a woman’s career, especially when she has children. Balancing being feminine in a male dominated field can be difficult. According to Marilyn vos Savant, the person with the highest IQ at 200 and famous advise writer, states that women who play up their sexual attractiveness make themselves appear ‘lightweight’ and lose ‘parity’ with men. This is not okay, since a woman faces pressure in society to look attractive and be nurturing, similar to how men are valued by being a provider. This is a real dichotomy. Women are not allowed to be seen as sexually attractive and competent. It is as if there’s a choice to be made. That is a real problem. WordPress has been found to be a community of people who like to think about technical things/questions. Over the years it has grown more and more toward a marketing and business focus as WordPress grew and continues to grow in popularity creating more and more opportunity and needs to fill. I found the community to be a place to bring questions to. It has been a place to find inspiration and to inspire others in my professional journey as a developer. The community has helped me to develop the courage and determination to secure a position as a developer. The WordPress community has been a resource of a network of individuals to turn to for help. It is an open source and sharing community with many talented people. Elizabeth Shilling, a developer with a degree in psychology with a social, developmental emphasis from UC Santa Barbara, specialized in biological sciences, computer science, business, and teaching. Looking at differences between men and women in math and sciences bloomed during research as an undergrad. It was determined to be cultural, not biological. Social expectations dominate the direction of female students away from engineering sciences rather than intellectual capabilities. She loves coffee and the ocean. 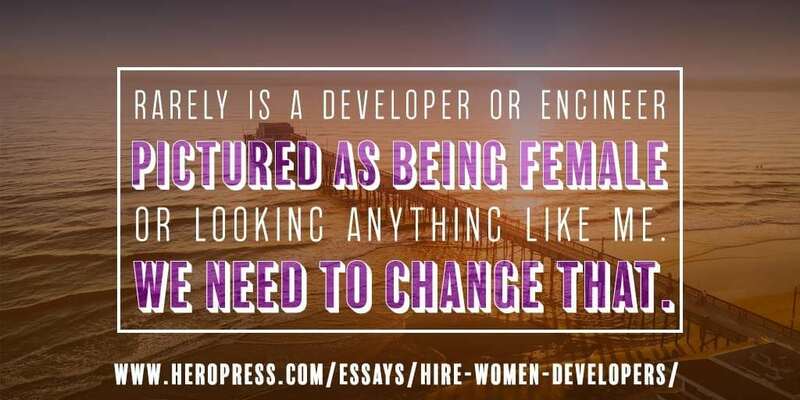 The post Hire More Women Developers appeared first on HeroPress.